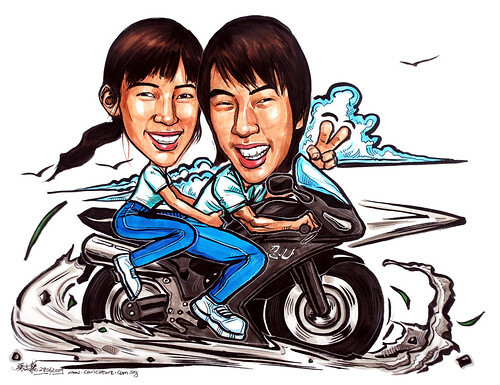 "...I would like to request the picture of me on a black sports motorbike(no specific model/design) with my girlfriend behind me as a pillion...."
Not an easy job. You may not be able to tell. The challenge lies in the angle the subjects faced in the photos provided. By right, the easier job is to draw the motorbike heading the reverse direction. The guy is in the 'correct' direction, but then te lady will be facing the back. I picked the tougher job, by choosing this direction - to the right. Hence, the guy have to turn his head back, facing his girlfriend. In that way, they look more loving. But my challenge is to make his posture looks logical, such that his head doesn't look twisted by 180 degrees. To make his girlfriend sits close to him, and not a lot higher than him, I draw her head smaller. I didn't realise that I am doing it the hard way, till the end of the drawing. I spent quite a long time on this artwork. But it is worth the effort, looking at this completed drawing.